This feature story, co-written with Lilly Zhang, was published in the South China Morning Post on August 23, 2012. With China and Africa forging one of the most important economic relationships of the 21st century, Hong Kong may be a key facilitator and hub for their bilateral trade – a role the city has yet to embrace. China has funded extensive infrastructure projects in Africa, including a transit route for mining built in 1975 and even the African Union’s US$200 million headquarters, which opened in the Ethiopian capital of Addis Ababa in January. And last month President Hu Jintao , in a speech to African leaders at the Forum on China-Africa Co-operation Ministerial Conference in Beijing, pledged US$20 billion in new loans for infrastructure and agriculture to the continent over the next three years – double the amount it offered in 2009. In response to China’s growing presence in the world’s second-most populous continent, which has 54 sovereign nations, foreign media have spun simplistic narratives of the new “colonisation” of Africa, and China battling the West over Africa’s riches. Beyond this sinister paradigm, little attention is paid to interpersonal relationships between Chinese and African people. The media has also overlooked the many Africans who have come to Hong Kong, where they play important roles in expanding business ties between the two countries. “I think that most of what one reads plays up the contest between East and West and neglects the voices of the most important actors: the people at the ground level, both African and Chinese,” said Columbia University journalism professor Howard French, who visited Hong Kong last month. “Instead, the forces are distant and faceless. It’s either the Chinese state with a plot to take over Africa or the Chinese state with a plot to do good things for Africa,” said French, who gave talks at the University of Hong Kong and the Foreign Correspondents’ Club. The former New York Times bureau chief for Shanghai as well as West and Central Africa will release a book next year about the new Chinese in Africa. The international community has criticised China for its big-business practices, allegedly co-operating with corrupt governments, mistreating workers, exploiting Africa’s rich natural resources – which include oil, precious metals and coffee – and taking jobs away from locals. Nevertheless, trade growth between China and Africa has remained at more than 30 per cent each year over the past decade. However, the lucrative trade’s potential to expand further depends on improving precisely what professor French says is often forgotten: personal relationships on the ground. Hong Kong, for one, has a pivotal role in improving trade ties as an attractive global trading hub. The city’s orderliness and low corporate taxes are among the perks, but African businessmen at times complain of prejudice and the lack of cultural understanding. Some African traders first ventured particularly to Guangdong, the mainland’s most populous province. But disappointed at the lack of regulations to protect their investments, many have since migrated to Hong Kong. African traders now tend to conduct business in neighbourhoods such as Tsim Sha Tsui and Sham Shui Po, where they buy Chinese-made mobile phones, electronics and clothing in bulk to resell in their home countries. But he said that while many Hongkongers know that African countries’ economies are growing fast (seven African nations are on the list of 10 fastest-growing economies this year), there is still prejudice. “Hong Kong is supposed to be an international city, but the fact is that many locals still think of Africans as ‘dirty’. It’s not as bad now, but a few years ago, if a black man sat down on the train, everyone would clear off the bench,” Jefferson said. 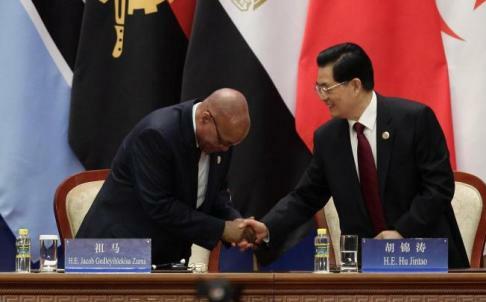 Dr Yan Hairong, from Polytechnic University’s social sciences department, agrees that many Chinese businesspeople lack respect for African cultures. “They should learn to understand that Africa has a complicated history and that each African country has gone through a distinct path of development, which is influenced by many historical, political and economic factors. “Many Chinese simply ignore these contexts and attribute Africa’s relatively low level of development to a lack of ability and hard work by Africans,” she said. Similarly, most Chinese migrants living in Africa shun Africans there as well, according to Adama Gaye, a Senegalese business consultant and author of one of the first books on Chinese-African relations, China-Africa: The Dragon and the Ostrich. “You don’t see Chinese workers talking to African workers on the street. In the Chinese embassies, there are separate benches for Chinese and Africans. That isn’t good for building positive long-term relationships,” he said. In Hong Kong, these dynamics often play out inside the iconic Chungking Mansions in Tsim Sha Tsui, where traders from sub-Saharan Africa have become one of the most prominent ethnic groups since the late 1990s. Gordon Mathews, an anthropology professor at Chinese University and author of Ghetto at the Centre of the World, a book on Chungking, coined the term “low-end globalisation” to refer to trade in the building. He estimates that at least 20 per cent of the mobile phones sold in Africa have passed through Chungking. Diallo Mohammed Ali, 38, from Guinea, is an electronics, clothing and gems dealer who moved his business to Chungking Mansions in 2009 after spending three frustrating years in Guangzhou, the capital city of Guangdong. Besides the greater language barrier, he complained of having culture clashes with mainland businessmen. “We tend to go straight into the negotiations, but the Chinese are not like that. That brings challenges,” he said. Ali said he would rather do business in Hong Kong because of its more reliable suppliers, locals’ English proficiency and the relatively lower risk of being cheated. “Rent and cost of living are higher in Hong Kong, but I’d rather pay more than get nothing done,” he said. Due to rising rents in Chungking, Ali has moved to an office across the street – which incidentally doubles as a meeting place for African Community Hong Kong, a registered non-profit group committed to cross-cultural exchange. Ali is the president of the group, which was founded in 2009 and aims to help Africans get familiar with Hong Kong society’s values, laws and regulations. It also helps Hongkongers better understand African culture. Invest Hong Kong, a government organisation, has helped support African businesses in the city, but their ventures in Africa are still in the early stages. “InvestHK sees the potential for African businesses that can consider expanding to other parts of the world from our city,” a group spokesperson said. This month, InvestHK will launch a project in South Africa that will support companies interested in using Hong Kong as a platform for trade with China and other Asian countries. Meanwhile, recognising a need for a nongovernmental group to facilitate such activities, African Community Hong Kong has partnered with a Hong Kong-based international holdings company to launch an organisation that will function like a chamber of commerce. Earlier this year, a Ghanaian intern at RGL Holdings’ Sheung Wan office introduced managing director Jong Li to the board members of African Community. RGL, which provides low-cost technological services and office space to entrepreneurs in Hong Kong, agreed to help the group set up their website and e-mail domains for free. A breakthrough in their efforts to bridge the culture and trade gap was the accreditation of the African Business Association Limited (ABAL) in February. It will officially launch next month and plans to assist Asian as well as African firms and traders, who will form its membership. Bryan Steve Goldman, the vice-president of African Community, hopes ABAL will help fellow Africans integrate. “You see traders in Chungking carrying around tens of thousands of dollars in cash because they don’t have a bank account … either to avoid paying taxes or because they don’t have a valid visa,” he said. ABAL also plans to host a trade forum in Hong Kong that will coincide with the popular China Import and Export Fair, or “Canton Fair,” which will take place in Guangzhou from October to November.